Appears the short 12-13 TDs cycle bottomed mid-day Jan 2 as the market closed with little change. So the week of Jan 5 should be up and a top around Jan 12 for this shorter cycle and the next bottom around Jan 21. The 23TD cycle (some refer to as the lunar cycle - 28+ calendar days) should bottom also around Jan 21. Update: oops, no bottom on Friday. Thank you, I appreciate your blog and sharing your work. To me the 20 and 40 trading day cycle lows, when they converge, have been the most consistent and predictable. John - we have to be careful when we talk days. Are we talking calendar days (21 days is 3 weeks, but only 15 Trading Days (unless there are non-trading holidays within that 3 weeks). I generally reference TDs, whereas some reference calendar days. For example - 20TDs is 4 weeks or 28 calendar days or what many reference as a lunar cycle. Hurst normally uses 20/40 references and your observation of synced bottoms generally provide the most volatility, but still does not account for even longer or shorter cycles. For swing trading we normally look at 12TD or shorter cycles. If we are in a strong trend we may use somewhat longer cycles. 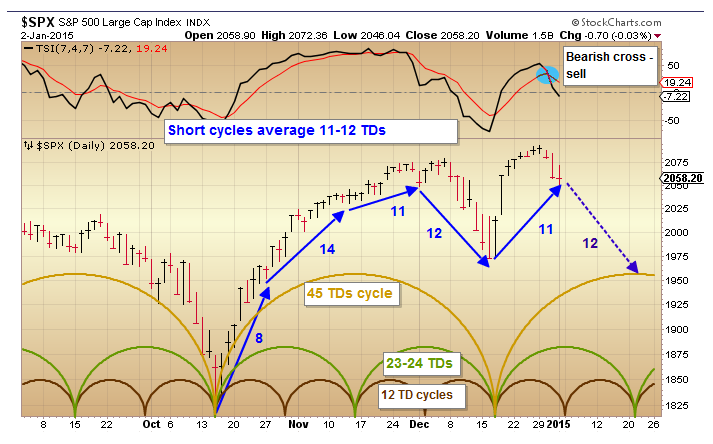 In a choppy market we may trade shorter cycles (6-7 TDs). In general I agree with your observation.